With so many wonderful SSF horses in competition today, it’s impossible for us to keep up. Fortunately, we have you to help us! If you have news that we should include on our Accomplishments page, please submit your information and photos here. Godot SSF and Eiren Crawford at Dressage at Devon. 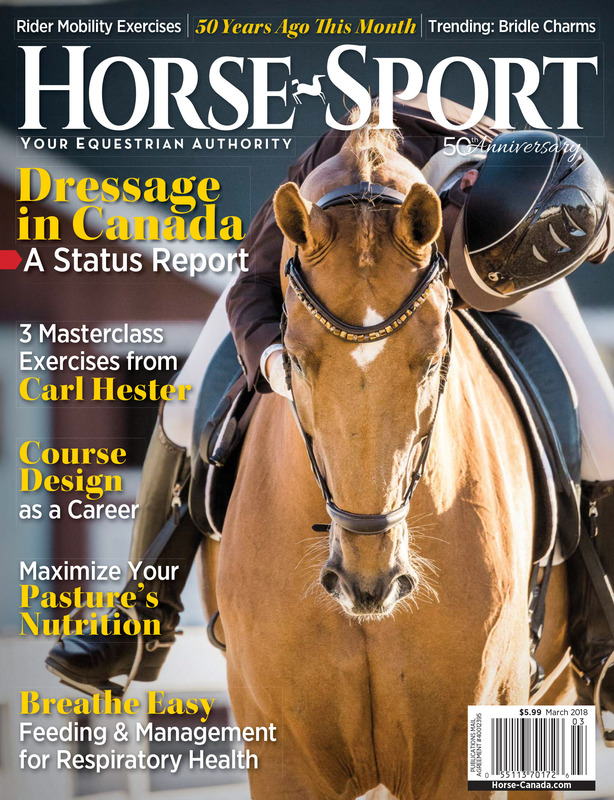 March 2018 | Godot SSF (UB-40 x Sir Sinclair) and Eiren Crawford made the cover of Horse Sport Magazine! (“Sammy”) were very successful at Devon this past season, winning the USDF six-year-old class with scores of 79.6% and 77.2%. ‘The goal with Sammy is to begin doing some FEI work this year,’ she said of her plans for this horse, whose future she is quite excited about. Michaela accepts the Platinum Breeder Award at the KWPN-NA Annual Meeting. We were so pleased our daughter Michaela Tolman could represent us at the KWPN-NA Annual Meeting to accept our Platinum Level Breeder’s Achievement Award. This hard earned award is based on keuring and sport results and puts us among the top five breeders in North America. Shooting Star Farm is truly a place where dreams come true. 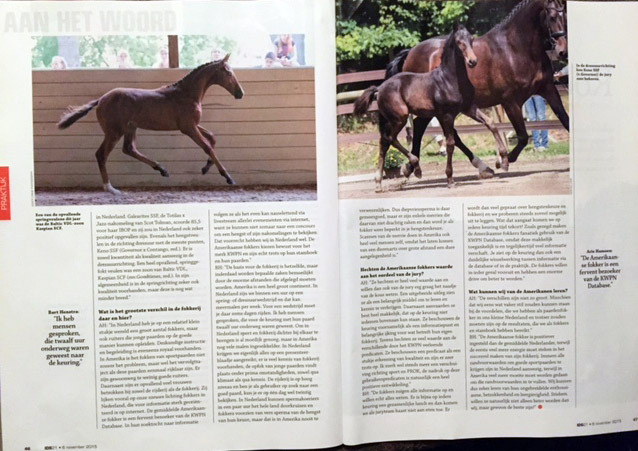 In 2015, we were honored to be chosen the KWPN-NA’s Breeders of the Year. 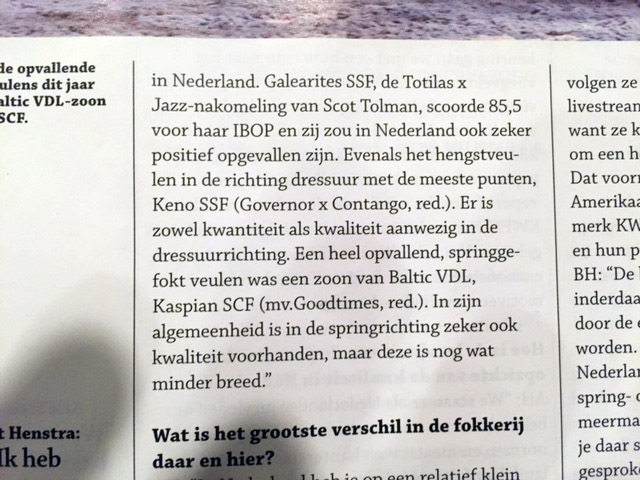 Scot has been breeding Dutch horses for over 20 years. He is a KWPN-NA Gold Level breeder. 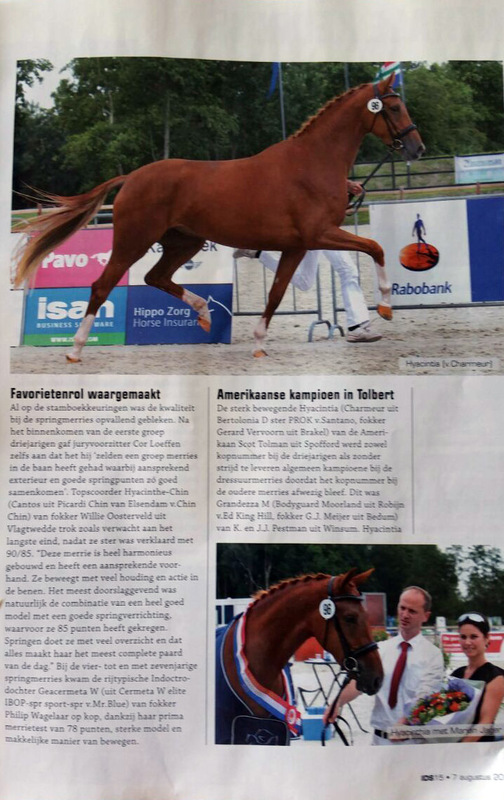 (Jazz/Roemer) is the highest indexed dressage producing mare outside of Holland. Orchis was selected for the initial breeding’s to Totilas. Scot has written articles for Warmbloods Today, KWPN-NA newsletters and has an active blog with his reflections on breedings and blood lines. He imported the stallions Zeoliet and Donetelli, and was instrumental with the group that imported the stallions Freestyle, Iroko, and Heirarch for American breeders. 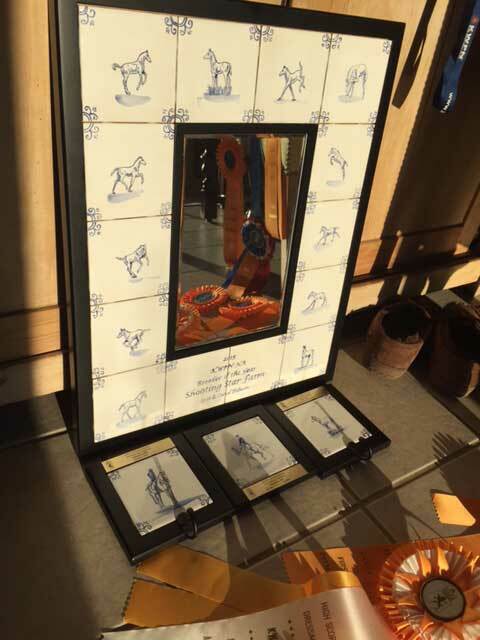 His goal is always trying to better the KWPN horse in North America. 2015 was a banner year for Shooting Star Farms. They presented six foals, all of which received 1st premiums. The Governor/Contango foal, Keno SSF was the 2015 North American Champion Dressage Foal. Galearites SSF (Totalis/Roemer) received her keur and had the highest scores for both the DG Bar Cup (85) and the IBOP (85.5) in North America. She was the 2014 North American Champion Dressage Mare. Honorites SSF (Totalis/Roemer) received her ster predicate and an IBOP score of 75. She placed in top five for the DG Bar Cup. Felicities SSF (Totalis/Roemer) and Eliscia SSF (UB-40/Pass The Glass) received their ster predicate. Both mares placed in the top five for the DG Bar Cup. Orchis received her Preferent predicate. 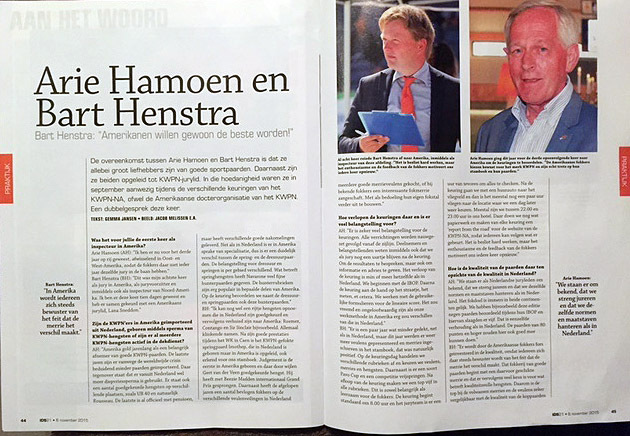 the KWPN horse has benefited and educated many people. 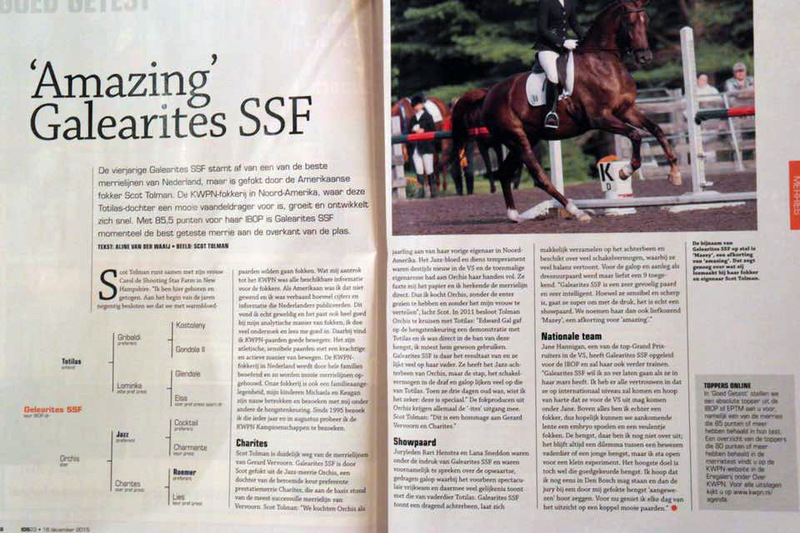 SSF has appeared in numerous magazine articles over the years in North America and Holland including Warmbloods Today, In de Strengen and Paardenkrant.